Is there a place for art in the startup world? If you ask Rine Boyer, Signal’s Manager of Knowledge Management, there’s no question: Working in a tech firm, where nothing stays the same from one minute to the next, and everybody has to think quickly, breeds it. “Sometimes, I feel like I’m more creative in my day job because things need to be figured out on the fly,” she says. If anybody at Signal understands how art intersects with business, it’s Rine. In addition to overseeing the documentation of Signal’s technology and describing that to our clients, she’s also an internationally-known artist. Rine’s work has been exhibited around the world, most recently in solo shows at Bluerider ART Gallery in Taipei City, Taiwan, and at the Illinois Institute of Technology in Chicago. If you have a sharp eye, you might have noticed her work hanging on the set of NBC’s Parenthood. 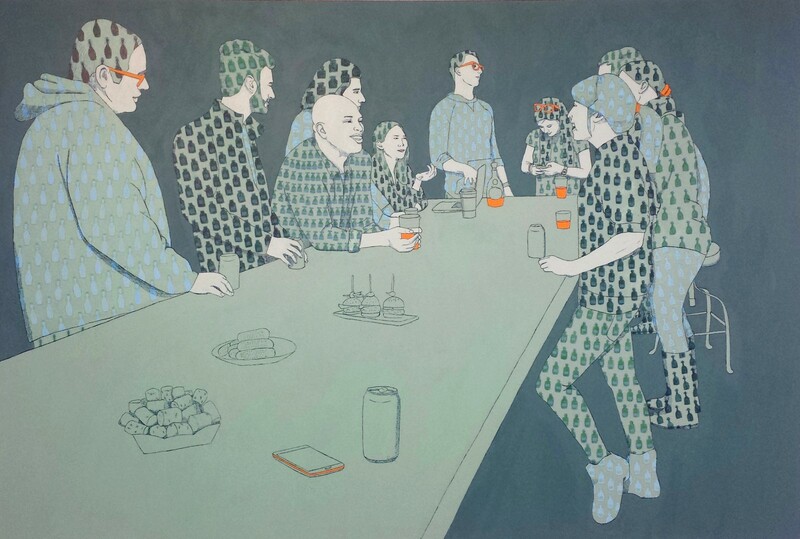 “Happy Hour” by Rine Boyer. The painting was inspired by Signalites hanging out at the office after hours. Even if you don’t see coders as artists, Rine sees a place for the arts alongside technology. She is currently hard at work on a new project inspired by Signal’s Hack Week, curating a show that will feature local artists here at Signal’s headquarters. “I think it’s relevant for technology to have a connection to the arts. It’s nice for people who aren’t in a creative field but are thinking creatively to see what’s out there,” she says. And it’s opportunities like this, along with other ways the company encourages creativity, like Signal’s book club, design group, supper club, and games night, to name just a few, that open the doors to creative problem-solving for business. “Signal offers us a lot that’s not just sitting at your desk doing work. It’s influencing how I think, but it’s not specifically for my role,” Rine says.